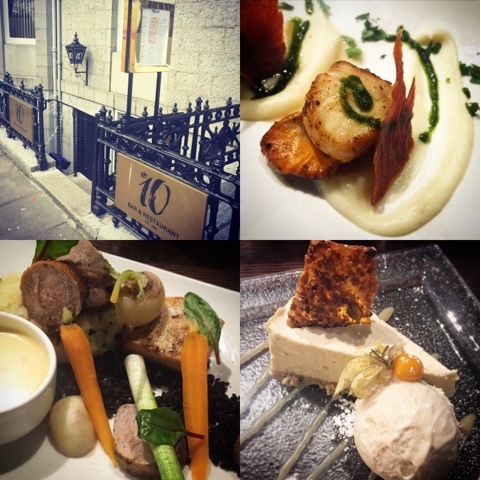 There have been some new eateries on the streets of Aberdeen in the last few months and although I shared my visits to them on my social channels at the time Muchacho, CUE Barbecue, No. 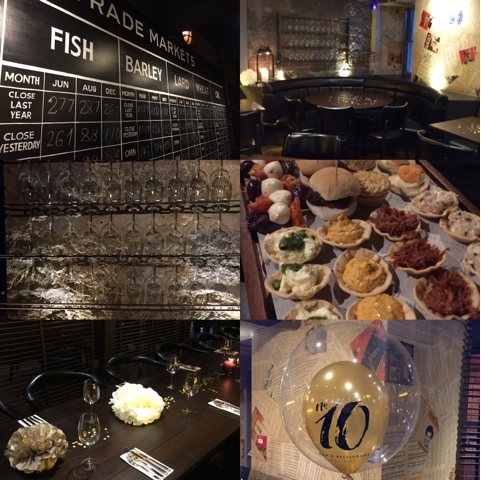 10 and Melt also deserve some blog love. 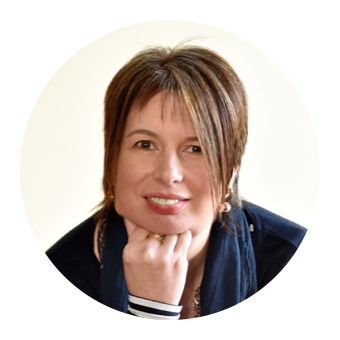 Sometimes life throws things at you and the start of 2016 has been one of those times so I'm playing a wee bit of catchup with this post. For all of my foodie adventures as they happen make sure that you're following me on Instagram, Twitter and Facebook. Can't quite believe that at this moment in time I have over 17,500 followers across those three channels. Many thanks if you are one of them. No 10 is a longstanding Aberdeen institution. A stalwart of the West End scene for many a year and very much a place to go to watch the rugby or for a pint after work on a Friday. When it closed for refurbishment at the end of last year I'm sure I wasn't the only one who was a wee bit apprehensive about what the new look 10 Queens Terrace would be like. No need to worry as the baby had most definitely not been thrown out with the bathwater. The best of the old has been combined with a new spacious layout with a distinct restaurant, bar area and a private dining room. Sheet music on the walls, funky chalkboards and stylish decor throughout only add to the ambiance. The menu changes seasonally and focuses on local produce with a good mix of traditional and innovative bistro style dishes. I tried out items in canape form from the winter menu at their opening party and was invited back for a meal when the spring menu launched. I thoroughly enjoyed my wonderful Shetland Scallops to start followed by melt in the mouth Braised Belly of Pork. Somehow I still managed to make room for Peanut Butter Cheesecake. Well worth checking out the reincarnation as it's something a wee bit special. Aberdeen has for a long time been somewhat lacking in Mexican food, bar the usual high street chains. 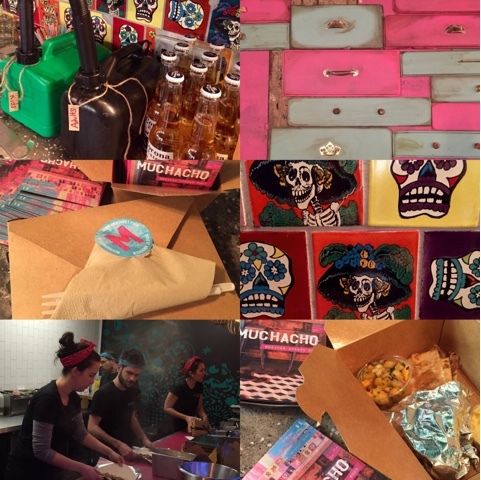 Muchacho in Rose Street is a small but perfectly formed street food outlet which opened its doors in January. Primarily offering take away there are however a few benches and bar stools available if you want to eat in. 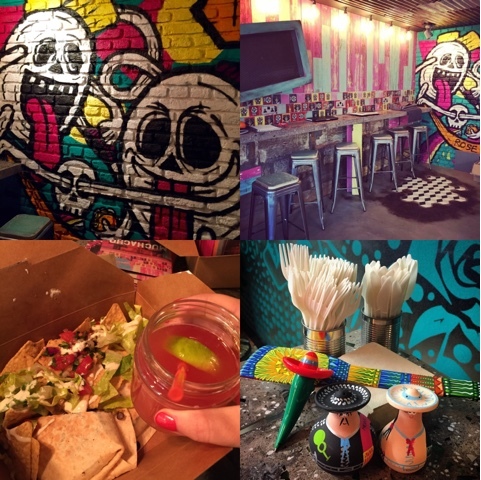 The look of the place is amazing with bright colours, grafitti art and quirky touches abounding. I'm really not much of a chilli head so I was slightly nervous about it all being too hot hot hot for me but each dish is created to your own spec from a menu of options. The best way I can describe it is as being similar to Subway. First you choose your base - Burrito, Enchilada, Taco, Quesedilla etc. then your filling - Adobo Chicken, Roasted Vegetables, Pork Carnitas or Guerrero Beef. Then comes the salsa which ranges from a wimpy Pico De Gallo to the mighty Punch In Your Face, which promises to do exactly what it says on the tin. I absolutely loved the Pork Carnitas Quesadilla however my top recommendation is the under the counter smooth sweetcorn salsa. It's not on the menu but be sure to ask for it and tell them I sent you. As soon as I heard about Melt I was smitten. A Cheese Toastie Takeaway. What's not to like?! Owner Mechelle turned around a former shabby shop into a cheesy heaven in only 40 days. Upon entering you feel like you've stepped back in time to the 1970's. Psychadelic orange wallpaper, flying ducks and a china cabinet that any retro housewife would be proud of. Such was Aberdeen's craving for cheese that Melt completely sold out on their first day and had to close early. The sourdough bread comes from my friends at The Breadmaker and there's also a GF option available. 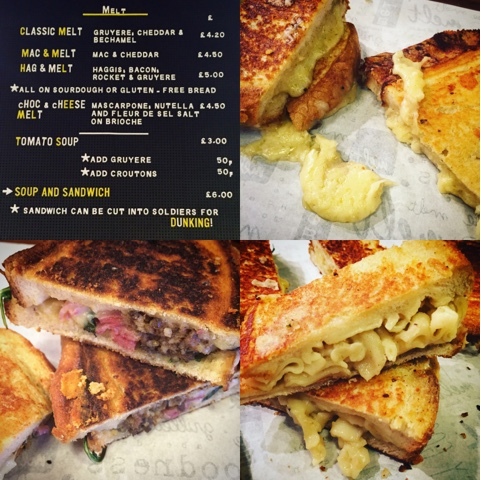 I reckon the the Mac & Melt would be THE perfect hangover cure. Total Carb Overload. My personal favourite however was the Classic Melt. A foundue sandwich of epic awesomeness. I wasn't too sure about the sweet option of Nutella and Marscapone, give me cheese over chocolate any day of the week. There's now a weekly special on offer and I'm kicking myself for missing the Frisco Frico the other week comprised of avocado, bacon, vine tomatoes and cheese. 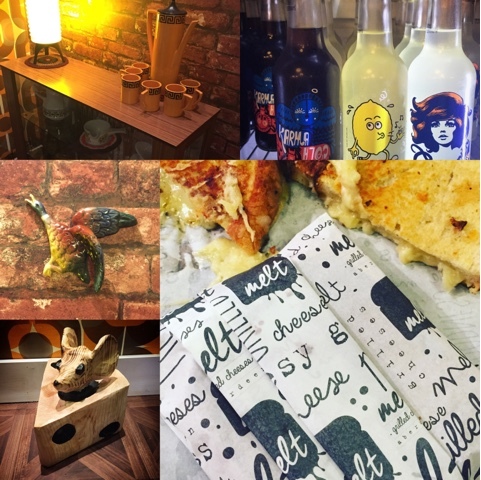 I'm the proud owner of my own wee corner of Melt thanks to their Crowdfunding campaign and I'll be back very soon to get my badge and claim my cheesy rewards. CUE Barbecue rose like a phoenix from the flames of The Courtyard. The former fine dining venue transformed itself in a couple of months into a Rootin' Tootin' Smokin' barcecue joint. 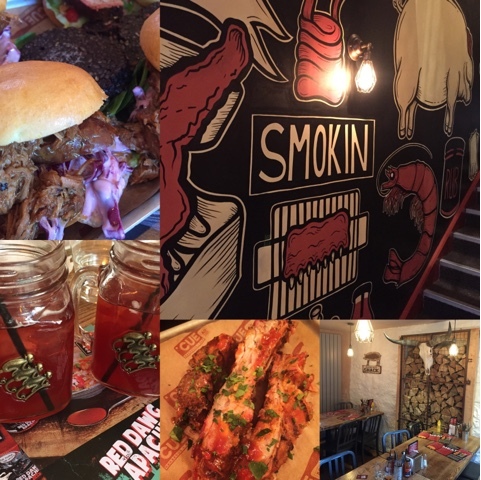 Combining the current BBQ craze which took Aberdeen by storm at sister restaurant Adelphi Kitchen with the rub me, smoke me, sauce me, eat me mantra of hot sauce gurus Angus & Oink would appear to be a winning formula. The menu is a wee bit confusing so perhaps best to ask staff for advice as some of the dishes are ordered by weight. A guide to spiciness of each dish/sauce would also have been useful. The meat feast itself was immense. 4 of us dined midweek for a family birthday and I was back again at a bloggers event on the Sunday. Glutton for punishment. Or perhaps just a glutton. Do make sure you check out the artwork done by the same artist that did the fab wall in Muchacho. Worth heading upstairs to meet Cue's mascot Unihog. 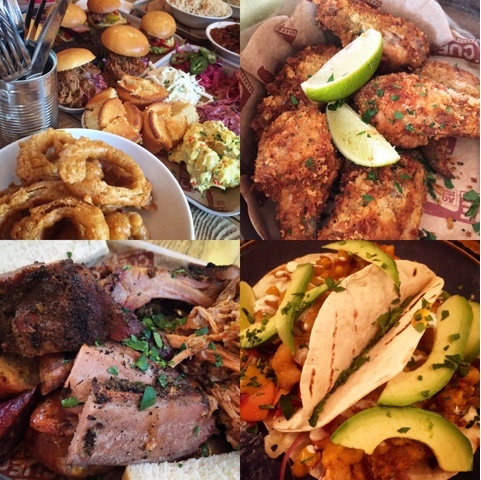 When it came to food I was as impressed with the sides as I was with the meat. The cornbread, pickles, potato salad, slaw and cheesy fries all come highly recommended. Alas on both visits I was driving so the cocktails have still to be sampled. Mine's a Cue Bloody Mary for next time. 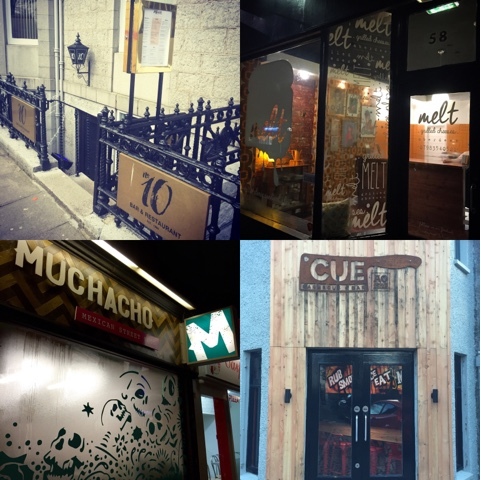 All 4 of these independent eateries are in a small area of the west end of Aberdeen close to Holburn Junction. Also in the vicinity are two more of my favourites. Almondine and Foodstory. Have we got the start of a rather special wee foodie enclave going on? I do hope so. Disclosure: Thanks to Muchacho, CUE Barbecue, Melt and No. 10 for inviting me to sample their wares. I was not expected to write a positive review in return. All opinions are my own and this is not a paid post.